I just finished my first knit hat in the round! I can’t believe I actually did it. It took forever compared to the scarves I’ve made. Most of the hat had 88 stitches around on 8 point needles. One row took me about 9 minutes. My hands are achy and my fingertips hurt. Maybe I’ll try fingerless gloves next? p.s. The hat is actually a nice gray not blue like the photo suggests. The sun was setting and I made Greg run outside to take my photo in front of the neighbor’s house. I only got one shot before he screamed it was too cold and ran back inside. Thanks for the compliment Jeanne but it took me about 10 hours to make. I’ll stick to gifts for now. Katy, I just love this hat. You should sell them on etsy; I know I would buy one! Fun hat. I too recently began knitting (can crochet with my eyes closed) and love the process. Hats are more challenging than scarves but people appreciate them as a gift. Keep on the path. Any pictures of NYC from your last trip? That’s where i am writing this from. I live both in the country and in the city so i cant relate to your photos of both places. It’s adorable… I want one! I love the part about Greg screaming and running back inside. The things we ask our guys to do! That’s wonderful, Katy! Congratulations! If I tried to do something like that, it would turn out looking like a ball of yarn. Katy (yes, I read your blog, but don’t comment…I know, shame on me)! Love the hat! Hats are pretty much my favorite thing to make since they are so easy, and always turn out cute. My “pattern” is to cast on about 80-90 stitching depending on the size of the head and yarn gauge (my rule of thumb is 85 stitches on size 8 needles). Join the first stitch of the second row with the last of the first by simply knitting them together, knit until the hat measures about 5 inches. Then I decrease by knitting 10 st, knitting 2 together and repeat that for about 5 rows. Then knit 7 stitches, knit 2 tog, repeat about 5 rows. Then knit 4 stitches, knit 2 tog, repeat about 3 rows. Then knit 2 stitches, knit 2 tog until there are only 5-10 stitches left. Close by threading loose end through the remaining stitches and knot. EASY! Oh, and at some point you will need to change to double pointed needles (I do it when I have about 40 stitches left). so great! congrats! if anyone tells you that gloves are easy- run and run fast- what a freakin’ nightmare! I took a class. But it’s a basic hat with a rolled brim in all stitch. Maybe a real knitter could suggest a good site for a basic pattern? It’s beautiful! I just learned to knit and am just about to finish up my first scarf. 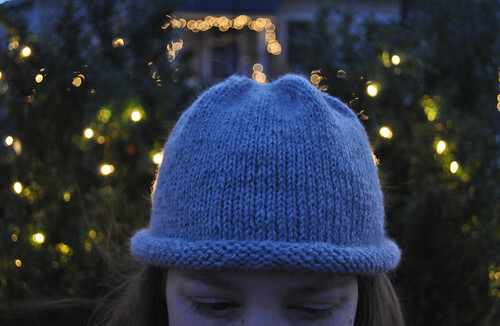 What pattern did you use to make the hat? Can it be found online? Katy, you did it!! Wow and it it looks great!! I’m proud of you. We need to get you back on the piano to exercise those fingers. Very nice. LOVE it! Congrats!! Try the Alice fingerless mittens – SO easy and a quick knit!